Kittens six weeks and older become interested in socializing and moving about the home. They are inquisitive yet fragile. They are playful and sometimes get into trouble. It is our duty to teach kittens the house rules. In the meantime, let us learn how to kitten-proof an apartment or household where our kittens can play safely and satisfy their curiosity. The common household hazards for cats also apply to kittens, but these little felines get into places where adult cats can’t because of their size. When kittens come in contact with these household hazards, it can lead to injuries, accidents, health complications, and lethal consequences. Never take accidents with kittens lightly. These household risks are not unforeseen occurrences. It is our responsibility as cat guardians to be one step ahead of our cats and plan to prevent tragedies that can cost the life of our pets. To protect our furry friends, we need to know what they are inclined to do and be one step ahead of them to prevent danger. Top on our list of household hazards for cats and kittens are those deadly strings that attract our feline friends so much. Cats love to play with yarn because cats in the wild are known to chase snakes. There are even cat toys that have strings attached. There are two dangers to these long lines: strangulation and intestinal damage from ingestion. Yarns are not the only common culprits but if you love to knit and crochet, keep them away from your little furballs. It is not enough to place your knitting tools on the top shelf as cats can still climb to them. Secure them in a bolted cabinet and do not let yarn dangle when you work on your hobbies. Knitting is not the only dangerous hobby when you have cats, fishing can be hazardous to your cats too. They love the smell of bait and are attracted to fishing instruments. One of the most common strings vets remove from cats’ mouths, paws, and intestines are fishing lines and hooks. Fishing lines can cut cats’ intestines. Cats also love to play with drapes and blind chords. Keep your energetic cat safe from your window decor by tying or cutting excess chords. Kittens also love to climb and scratch on curtains, so it’s best to keep window treatments short. A scratching post and kitty window sill also help. Be wary of using rubber bands to tie chords. Cats love these worm-resembling, chewy rubber bands and are likely to ingest them. It is best that you steer clear from rubber bands when you have a cat household as these can pose a choking hazard or get trapped in their gut. Cats also love to chew on electrical wires which lead to burns in the mouth and electrocution. Chewed wires can result in fire hazards. It is best to use plastic covers for wires and cable chords. Be extra cautious with holiday lights as well. If you ask your vet for some holiday safety tips for cats, often your vet would tell you to keep tinsels and Christmas ornaments away from cats. Cat owners can sometimes become complacent when it comes to cat falls. Some studies even show that cats can survive falls from high-rise buildings. Still, falls can lead to thoracic trauma, brain injury, broken bones, and can be lethal if the cat isn’t brought to the vet. Kittens are not as resistant to falls as adult cats. Kittens can get badly hurt from falling off shelves, cupboards, or your entertainment center. Kittens are especially keen on getting through gaps in banisters and stairs. Our little furballs can get badly hurt if we don’t kitten-proof our stairs and furniture. If you need to cover those holes with mesh or even cardboard to keep kittens safe, do so. Kittens also have a habit of squeezing themselves in the gaps between recliners, convertible sofas, and folding beds. Collapsible furniture can crush your kittens if not assembled properly. Finally, look before you close appliances like washers, dryers, ovens, and the fridge if you don’t want to trap kittens that climb and cozy up in them. Giving cow’s milk, chocolate, grapes, and raisins can seem normal for others but the moment you adopt a kitten or a cat, it’s time to brush up on food and liquids that can be dangerous to cats. The food we consume cannot be tolerated by our cat’s body. They tend to vomit or have gastrointestinal, kidney, and organ infections with human food. For your cat’s safety, don’t let them eat off the counter when you prepare food. Be cautious of meat juices that drip to the floor too. Cover fruits you leave on the table and be careful of feeding your cats scrap food. It is especially important to be mindful of what your kittens are fed during parties and the holidays. Dog food is also a big no-no. Also, store all kinds of medications, yours as well as veterinary medications where your cats cannot reach them. More important, be cautious of the right dosage of meds and supplements you give your cats and kittens. It is all too common and dangerous for kittens to be given more dewormers and other meds and supplements than necessary. House plants and pets indeed do a lot to turn a house into a home, but if you’re not aware, your plants can threaten the lives of your feline buddies. Be careful of the plants you bring home and plant in your garden. Cats can get poisoned by drinking water from a flower vase with azaleas, lilies, rhododendrons, and other toxic flowers. Gardeners should also know that fertilizer is one of the most common household poisons to cats. Outdoor cats are at risk of fertilizer exposure that results in severe gastric upset. When mulching, avoid using cocoa mulch which are poisonous when ingested by cats. Also, don’t allow kittens outside when you need to spray insecticides. If you have a rodent problem at home, you may think of using rodenticides to prevent your cats from hunting them and catching toxoplasmosis and other cat infections. However, cats can ingest rodenticides especially in pellet forms and the situation can quickly turn life-threatening. Opt for snap-traps instead. Remove ivy plants from your home as these can also lure rats. Ivy plants are also toxic to cats. Rodent-proof your chicken coops and clear out bird seed waste as well. Finally, don’t forget to secure the garbage cans so rats as well as cats can’t have access. Flea and tick products can also be misused. Applying the wrong topical treatment can worsen the problem and put our kittens at risk. It is crucial to discuss the right flea and tick control program with your cat’s veterinarian. Kittens need to be trained to drink from their designated water bowl. Infection can arise when drinking from another pet’s bowl. Your toilet bowl can also attract a thirsty kitten and they can drown if they fall in the toilet. It is best to keep the lid closed or completely restrict your kitten from entering the bathroom. Often, households also use toilet bowl cleaners that can be highly toxic to a thirsty cat. 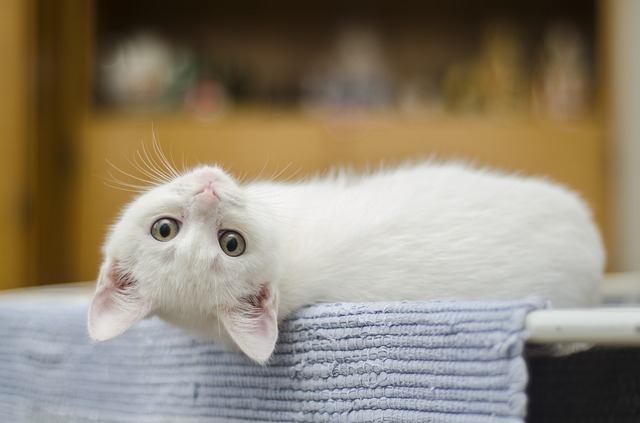 Other cleaning products toxic to cats include detergents, disinfectants, and bleaches. Common household cleaning supplies can lead to gastrointestinal distress and poisoning when ingested. Household cleaners can also irritate our cat’s respiratory tract. It requires a ton of patience to teach our kittens their boundaries. Sometimes, the best recourse is to distract kittens that gravitate towards unsafe areas. At best, we should strive to keep our entire home kitten-safe. If you can’t, install pet gates to put boundaries on your cat especially from the kitchen, garage, bathroom, and backyard. Under no circumstances should you shout at or punish a kitten for risking his or her life. Kittens often learn their lesson from one accident, but punishment can only lead to trauma and kittens becoming reclusive. Instead, reward good behavior like staying away from the toilet, dog food, curtains, garden plants, etc. Remove strings, yarn, and anything similar. If not possible, cover, store, or cut dangling pieces. Put up reminders to look before you close on all appliances and always make sure furniture are assembled and secured in place. Also, kitten-proof stair banisters. Cover fruits or food on the table and store medications in a place only you know. Store toxic chemicals and fertilizers properly in the shed, never leaving them in plain sight and reach of cats. Gardeners should also forego toxic plants and cocoa mulch in their garden, pots, and vases. Toilet seat should always be closed when not in use and household cleaners should be locked in storage cabinets with pet-proof locks. With these reminders, you can keep your home safe from strangulation, poisoning, drowning, and other accidents that can happen when you have kittens and cats at home. Remember, an accident comes at times when we are least prepared so be sure to stay on guard.